The mother of a schizophrenic attempts to end his relationship with a suicidal flight attendant. A large chunk of the Irish populace - this writer included - celebrate their birthdays in mid to late December. Nine months earlier, on March 17th, the nation celebrates St Patrick's Day, with many couples getting so caught up in the celebrations that they forget to exercise their usual cautions. The 26-year-old protagonist of Patrick's Day is an anomaly - born, rather than conceived, on the Irish national holiday, and named after the snake-banishing Saint himself. 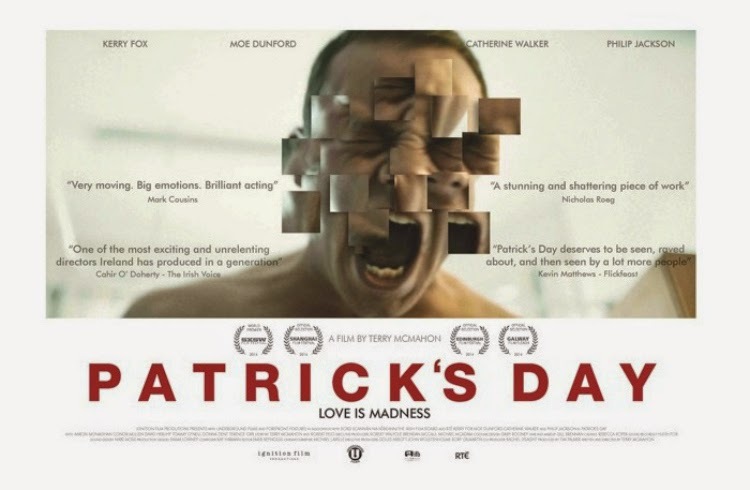 A schizophrenic who resides in a care home, Patrick (Dunford) celebrates his birthday each year in the same fashion. His mother Maura (Fox, the most recognisable name in a largely unrecognisable but impressive cast) books the pair into a hotel, takes Patrick out to the same restaurant for a birthday cake and decks him out in the same green afro wig. This year, however, the two become separated in the Dublin throng. Patrick has the good sense to make his way back to the hotel, but his mother fails to give him such credit and heads to the nearest police station in a panic. While waiting for his mother, Patrick has a meet-not-so-cute with drunken flight attendant Karen (Walker), who takes him back to her hotel room and proceeds to deflower the virgin. When Maura discovers this, she interrupts Karen's suicide attempt and warns the flight attendant to stay away from her son. Karen claims she has no interest in developing the relationship, but circumstances draw Patrick and Karen together, a situation Maura is desperate to see ended. Writer/director Terry McMahon burned more bridges than the cast of The Dambusters in his homeland with his divisive debut Charlie Casanova, which drew some of the most negative reviews ever bestowed upon a film by Irish critics. There was plenty to find objectionable about Charlie; filmed with an amateur crew, the movie looked and sounded just as badly as you might expect, but it was the film's simplistic class war politics that irritated most of its critics. Thankfully, McMahon is working with professionals for his follow-up, and though it has, for the most part, the artless look of a daytime soap opera, Patrick's Day is watchable and its dialogue doesn't sound like it was recorded in a wind tunnel. The pencil case politics aren't so front and centre this time, but the film does ask you to buy into a certain degree of lunchbox libertarianism. While the film's message (everyone deserves the right to intimacy) is laudable, the scenario presented feels decidedly misjudged, and frankly inconceivable. The character of Karen, the suicidal seductress, is the most troublesome. It's a struggle to buy into her motivations, and her sexual relations with Patrick never feel more than exploitative. For a while I awaited a twist that might reveal she was working alongside Maura to drive Patrick to suicide in a sordid Gaslight update. It's a shame, as the relationship between Patrick and his mother is quite well written. Though the film ultimately falls short, there are undoubtedly signs of progress from McMahon. He gives us a couple of striking images - a wall of photographs of Patrick's various birthday celebrations, his green wigs standing out in the pictures like traffic lights in rain; a visual reference to Hal Ashby's Being There that sees Patrick walk along the dividing verge of a motorway; and a powerful use of silence in a key moment involving a decision his mother found hard to make, but took nonetheless - but his reliance on the soapy cliches of suicide and unwanted pregnancy cloud the real human drama struggling within Patrick's Day's melodramatic framework. McMahon opens his film with an audio clip from JFK's 1963 visit to Ireland (this follows a patronising title card presenting us with a Collins dictionary definition of mental illness) in which the President speaks of the potential for greatness within the Irish people. After Charlie Casanova, few believed McMahon had much in the way of potential, but there's enough in his followup to suggest otherwise.